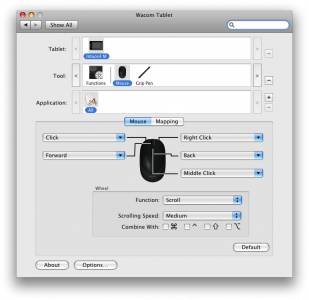 » Hardware review – Wacom Intuos4 tablet you down with FCP? It’s been a few months since I got my Wacom Intuos4 tablet. I like it and I figured I would put up my review of it and see what others have to say about how they use it. mouse – good but not great. the felt layer that it slides on gets gummed up pretty quickly and develops some stiction. That gets rather annoying. The scroll wheel + button in addition to the buttons in front of and behind the wheel make for a good variety of options without having to shift your hand position. I could see mapping the scroll click to insert edit, and the other two to cut and paste. One cool feature is that you can hit the ‘precision mode’ button and gear down your mouse speed by a lot. That is great when dealing with a fiddly mask. Pen– This is obviously the main reason for using a wacom. My only qualms about the pen are due to my own difficulties in using it. The behavior of the pen tool and the mouse are different by default. I only recently switched the pen mode to mouse mode and it has been much easier to use. Other than my own frustrations the pen works great. Pressure sensitivity in the adobe suite is great. The physical “pen flip maneuver” to switch to the eraser makes perfect sense, and it just feels more tangible than trying to draw with a bulky mouse. User-Definable keys: To the left of the tablet (or right, as it is ambidextrous) are 8 buttons and a scroll wheel. You can set them in the Wacom preference panel. I generally have issues with these buttons as I have my left hand on the keyboard 100% of the time, but they may certainly be useful in some specific tasks. jog wheel – works great for scrolling through a clip, but when the timeline is selected it merely moves the focus, not the playhead. 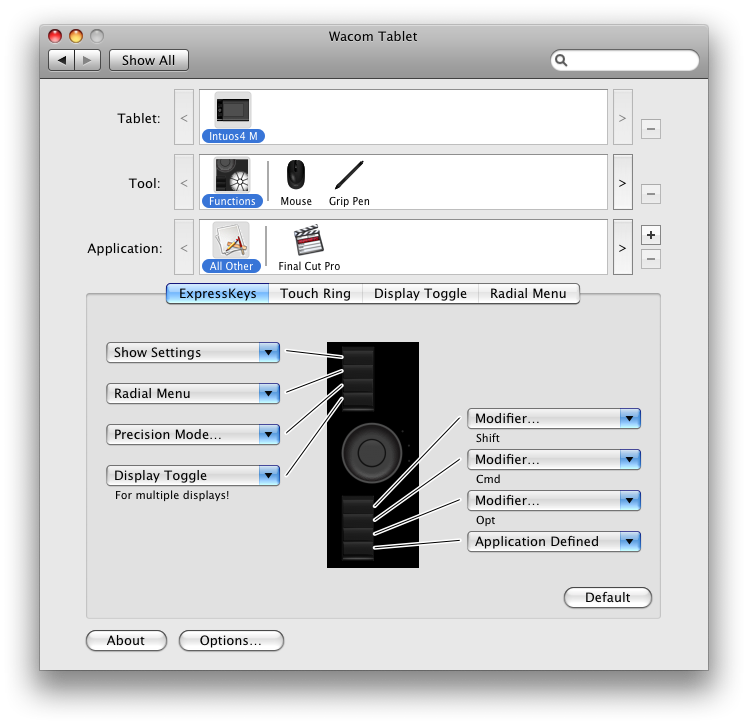 This can also be set to zoom the work area, change brush size, scroll through layers, and change rotation by clicking the center of the scroll wheel. 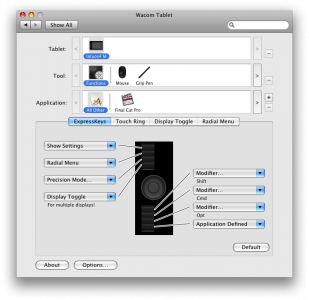 radial menu – not that cool, it creates a heads-up display that allows you to select menu items from a circular array. If my left hand wasn’t already on a 100+ key keyboard this might prove useful. As it is my muscle memory for being able to remember command-tab to switch app is much better than hitting the radial menu button, then using the pen to go to the northwest quadrant to select “change app”. I’m sure it has uses, but not for me currently. Now before I get too carried away, let’s back up. One thing that has quickly revealed itself about this tablet is that it is very good at specific things. The mouse is ok, but the pen is why people buy it. It has minimal benefit for using in final cut, but it is VERY useful when making masks, rotoing, painting or doing any sort of activity you might ordinarily do with a paintbrush or a pen. Since a lot of these tasks are the kind where you will sit down and crank out 100 frames in a few hours it can be an incredible benefit to have something that makes each frame faster and easier. I guess that explains why I got it as I was starting to do more VFX work. Overall it is amazing for some things, and adequate at others. I use a traditional mouse alongside the wacom one due to the annoying stiction issue, but when I need to sit down and roto something the pen comes in to save the day. If you are doing vfx or hand-drawn design work then this is a no-brainer. At the time I wrote this amazon has it for $440. It is relatively cheap considering the hourly bill rate of VFX work, and it will definitely give you a boost to productivity. Get it! Oh yeah, I almost forgot; they make all kinds of different pens, replacement nibs, and pen grips. If you find yourself working on one of these all day then definitely shop around and make sure you get one that fits your hand. ~ by ross on May 19, 2010. Man I could never imagine using a mouse again since i started using a tablet. Took a good month to get used to but my hand and wrist feels so much better now. Just a much smoother way of working. You may already know this already but they hide the extra tips the ink holder dealy thing. Cause they will wear down.